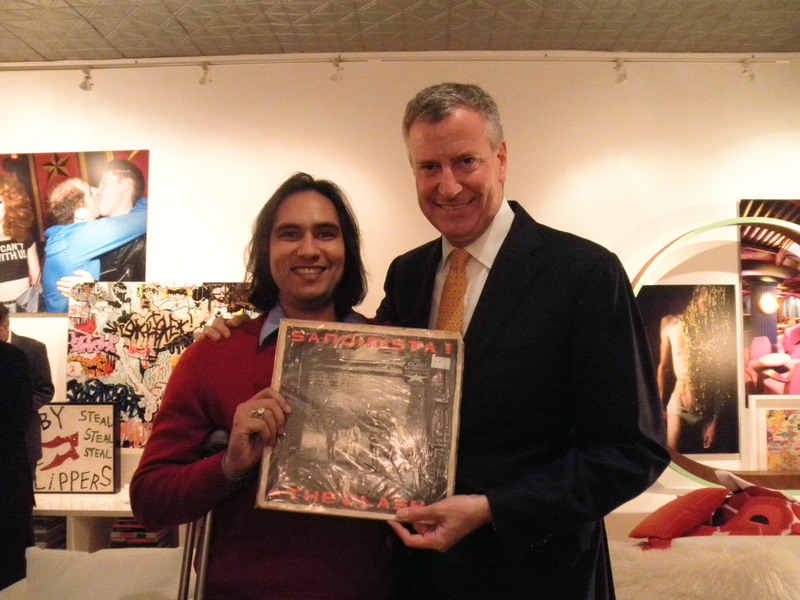 Say what you want about Mayor Bill de Blasio’s politics, but the man has excellent taste in music. In fact, we share the same favorite album: the Clash’s Sandinista! In 2012, a friend of mine threw a fundraiser for then-Public Advocate de Blasio’s mayoral campaign. As the party wound down, folks were getting in their one on one sessions with the candidate. I approached him, tempted to ask a hardball question, but good luck trying to get heartfelt, substantive answers out of well-trained candidates, especially during campaign events. I went for something that would tell me more about Bill as a person. “Ooh, that’s a tough one. Can I pick two?” What a politician thing to say. But I acquiesced, and gave him two picks. Me and Bill with potential Sheldon Silver challenger Paul Newell (left). “I would bring Sandinista! by the Clash, and Bob Marley Live in 75 (formally called Live! ).” This answer floored me. Sandinista! had been my favorite album since junior year of high school, having taken about a year to properly grow on me. The 1980 successor album to the far more popular London Calling, Sandinista! is weird, eclectic and righteous, a groundbreaking collection of punk, dub reggae, strange experiments and radio hits with politically charged lyrics about poverty and imperialist foreign policy. The Village Voice called it the best album of the year, and the Clash supported the album in New York with a legendary run at Bond’s Casino. Clocking in at 36 songs (a triple-record), some critics say Sandinista! should have been shorter. In fact, the Clash were trying to escape their record contract, to which they still owed three records. After much negotiation, they agreed to cut their own royalties so that the record label would only price it as a double-album. If I’ve ever encountered anyone who claimed Sandinista! as their favorite album of all-time, I don’t remember. 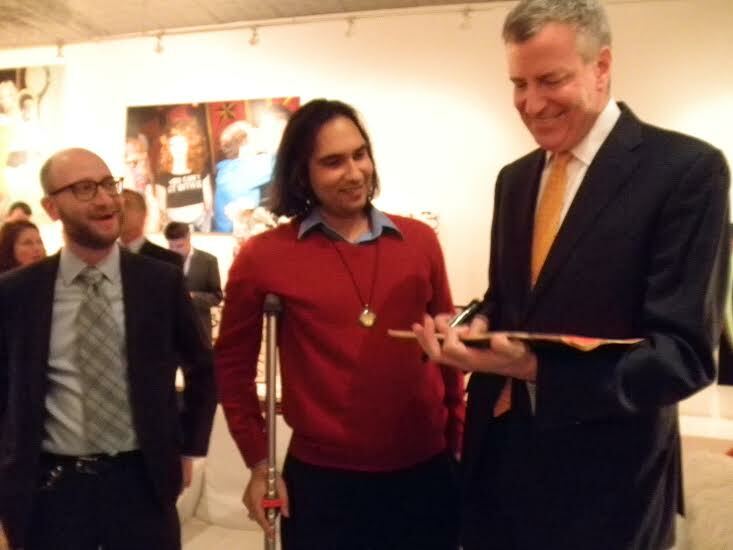 De Blasio and I began chatting about our favorite songs on the album. We’re both big fans of Mikey Dread’s performance on Living in Fame. As the 2013 mayoral campaign wore on, it was obvious that Bill de Blasio had a legitimately good taste in music. He was attracted to New York City as a young dude in part because of the Talking Heads, put together a video with Vampire Weekend, and displayed a surprising knowledge of hip-hop. Of course, it also came out that young de Blasio had been a big supporter of the actual Sandinistas, but it would be facile to suggest that’s why this is his favorite album. Flash forward to last Thursday night. I was at an event in the home of Bill Samuels, who was hosting an event for Congressional contender Vinnie Gentile. Gentile is challenging Staten Island District Attorney Dan Donovan for Staten Island (and part of BK’s) Congressional seat. There was more of a cluster around Mayor de Blasio than the last time I’d seen him. 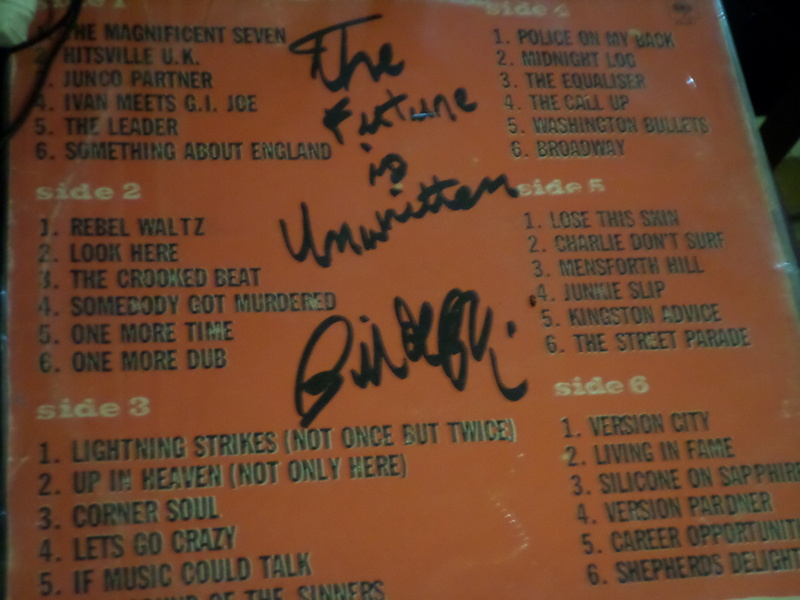 I asked him to sign my copy of Sandinista!. His eyes lit up. He told me that recently Dante has gotten into it as well, and you can hear it echoing down the halls of Gracie Mansion. Imagine that. Oh, and Live! by Bob Marley and the Wailers isn’t bad either. 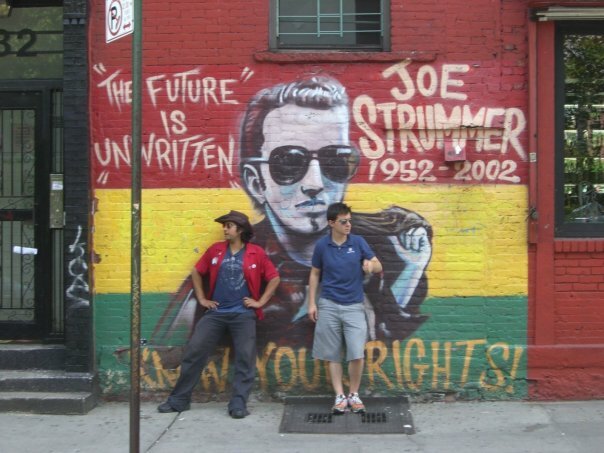 Me and my friend Brian at the Tompkins Square mural of Joe Strummer, circa 2008.